The HyCycle isn't the kind of thing you'd want to have to take through airport security -- at least not in its present state. The electricity-generating electric bike prototype is bit of a mess of wires and blinking boards at the moment, plus a battery that looks an awful lot like a block of C4. All are attached to one of its creators' rust-colored Schwinn road bike. The bicycle is a project of a group of Northeastern students, an attempt to build a cheaper electric bicycle -- one that can be offered as a do-it-yourself kit that users can snap to their existing bike frame. The front tire has a magnetic coil assembly (28 coils in all). When the wheel spins, the coils remain stationary and the magnet moves, essentially turning it into a dynamo and generating electricity. Once you're ready to use that energy, you click a switch on the right handlebar to activate the "boost," which powers the front wheel using the same magnet and coil structure, making pedaling a lot easier. It's not ready to propel you forward without assistance in the current prototype, but the bike's developers tell us that they're working on it. In its present iteration, you should get about an hour of drive time at maximum speed. Filling up the battery while pedaling takes around 8 hours, and for the moment, the bike doesn't support wall charging, though its creators assure us that that's an easy fix. Naturally, the bike has its own Android app, one riders can use to track things like velocity, battery status and such. 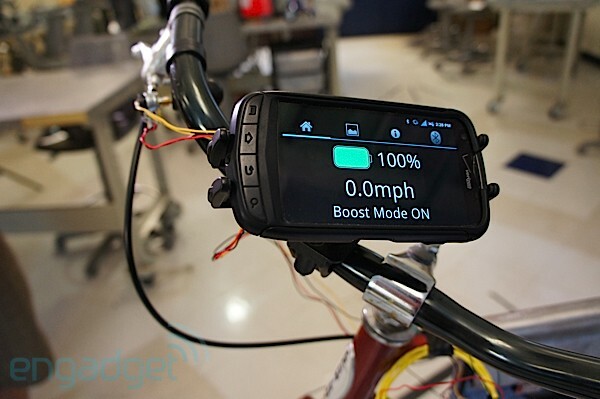 The phone grabs info from the circuitry over Bluetooth and can be charged by the bike when plugged in via a USB cord that runs across the handlebars. The project nabbed its makers a second place in the school's Capstone Engineering contest. The HyCycle's creators are looking to bring a cleaner, more compact version of the patent pending technology to market. At present, the cost per kit is around $800 a pop, though they expect that to come down as well. Sadly, we didn't actually get a chance to ride the bike, though, you can see it spinning in the above demo shot by some of the students. In its creators' defense, the HyCycle had to be hastily assembled, as they had all gone home for the summer and didn't know we'd be popping by the labs until just before our demo. The bike has been road tested a bit around the campus -- generating some stares wherever it goes. Hopefully we'll be able to take it for a spin the next time we swing through Boston.